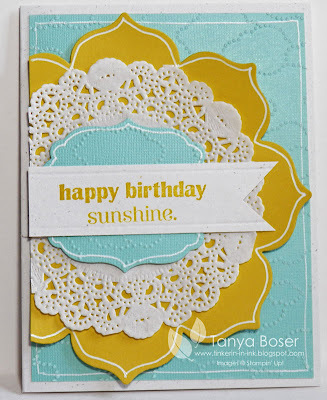 The challenge was to create something showcasing sunshine. Instant love and inspiration! How was your sunshine this weekend? Does this look a little familiar? Sorry, I just had to make another card with this color combo and pattern. Some things bear repeating. 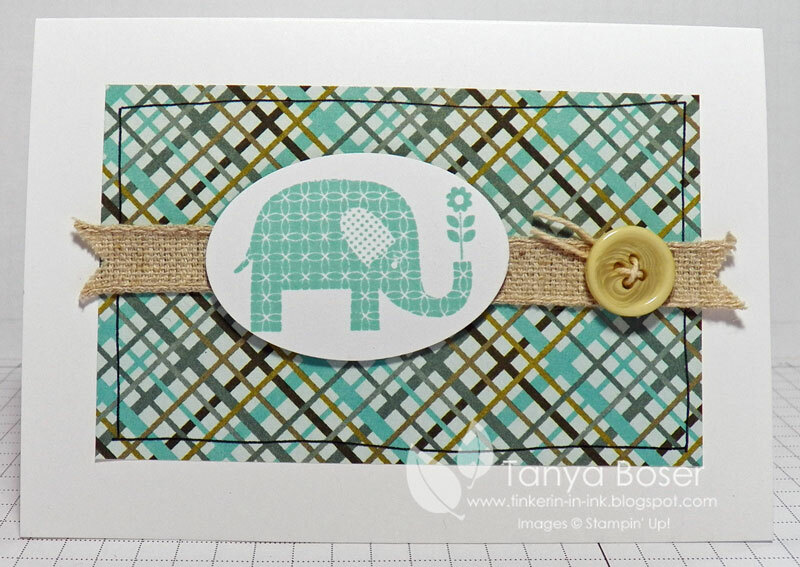 A few die cuts, layers, and some ribbon and this card is all dressed up with somewhere to go! My mother's favorite color used to be yellow. I don't know what it is anymore, and if she is anything like me, it changes fairly frequently! 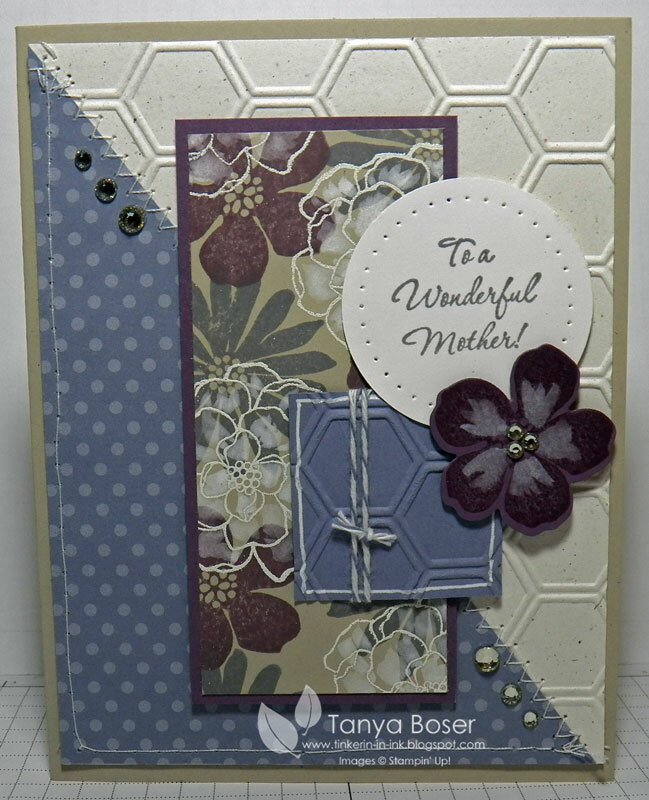 Here is another Mother's Day card! It would work for anyone really, but my intention was Mother's Day. Sadly, all of the stamps I used are retiring! 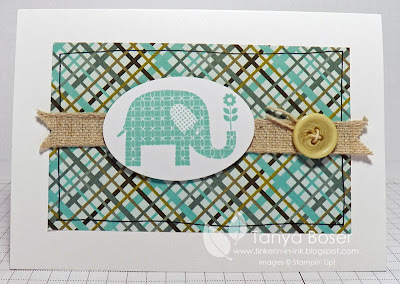 Retiring stamp sets are available through June 3, 2013 though so you can still get these sets for a little while longer. 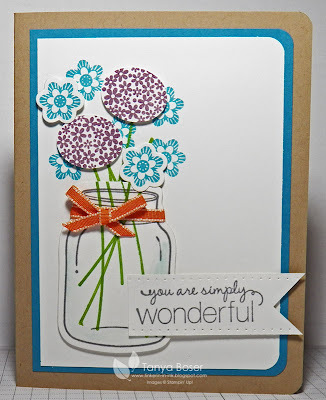 I stamped the jar, then uses a blender pen and Pool party ink to add some blue shading. 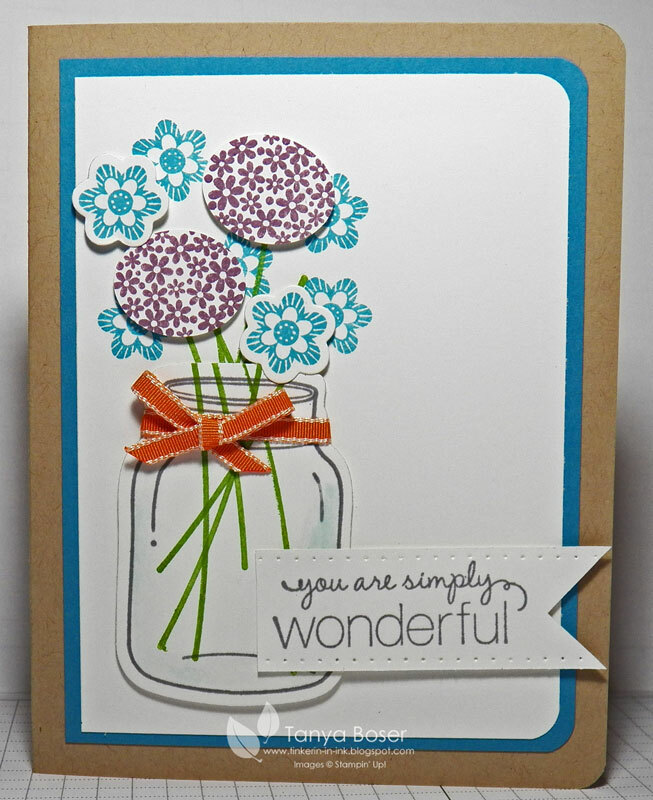 The jar was cut out with the coordinating die. 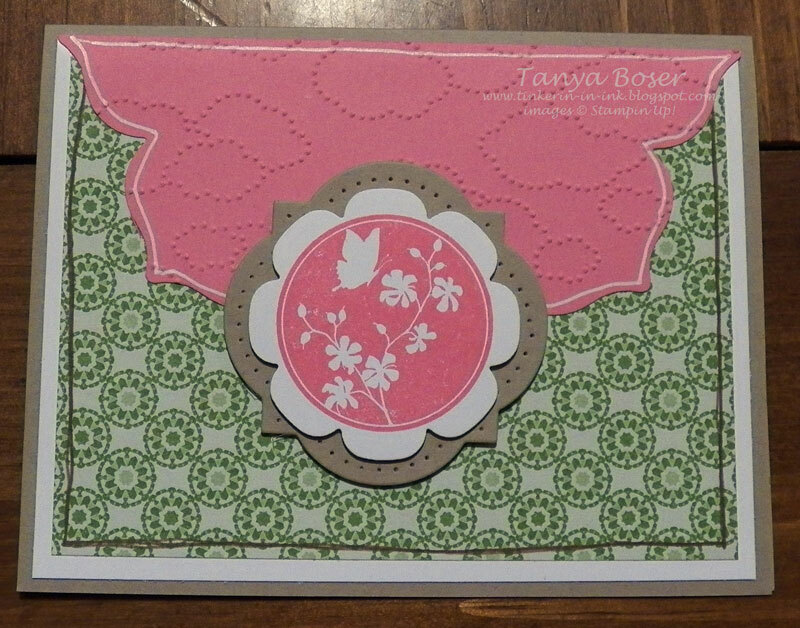 The hydrangea-like flower was punched out with the small oval punch and the blue flower has a coordinating die also. Don't ask me why I chose Pumpkin Pie ribbon..... I still don't know! 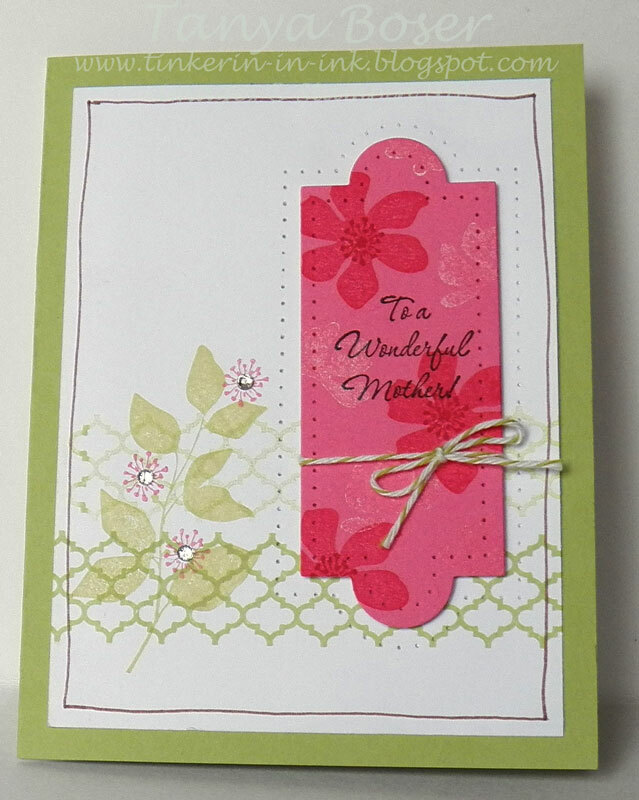 I have at least 1 more Mother's Day card to show you, and some more Main Catalog Preview stuff in the days to come! 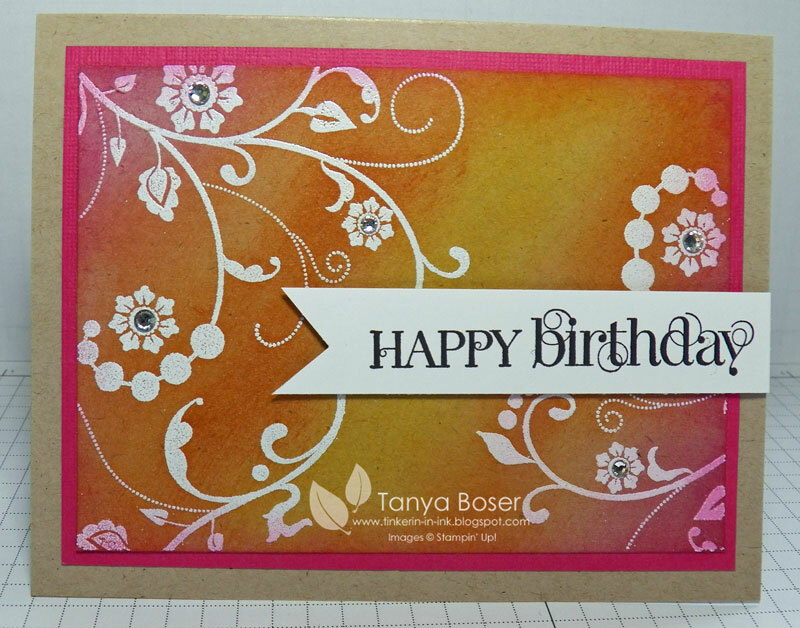 This is actually the second of three cards I made on Thursday after my box of goodies arrived. I am over the moon about the new colors and this set! The main panel was so easy to stamp, I just started in the middle and worked my way out eye-balling it the whole time! And the whole card idea just popped into my head after looking at this sketch from Retro Sketches. And one more view because I just could not decide which on I liked better! That will teach me to take more than 2 pictures of a card. So, did you spy the names of some new stuff? Well, I will be posting more new stuff in days to come. 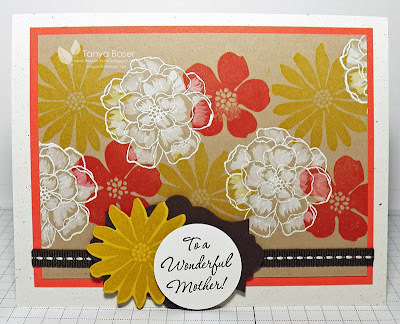 I also have more Mother's Day stuff coming as promised! 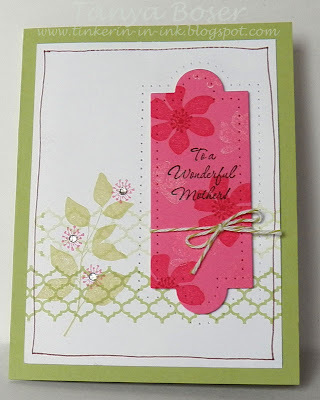 Here in the frozen tundra (that would be Northern Minnesota right now) we are wishing spring had sprung! I know that it will eventually. But I swear, if there is still snow on the ground in June, I am going to cry. I need some sunshine, and to play in the dirt. 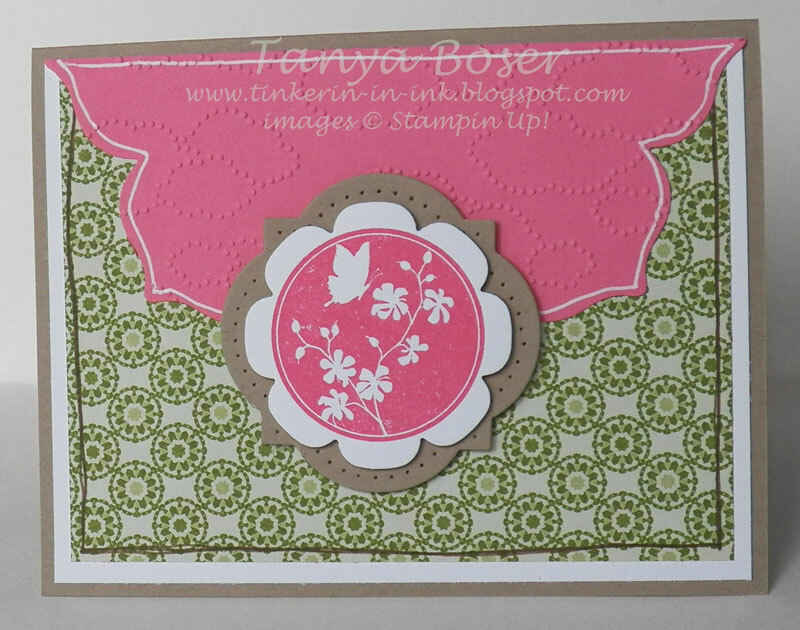 So in the meantime, instead of planting flowers, I will have to stamp them. I just finally broke down and ordered the Secret Garden bundle. I really like it. I hadn't seen too many cards I liked with it, but I knew I could do stuff with it that I would like. 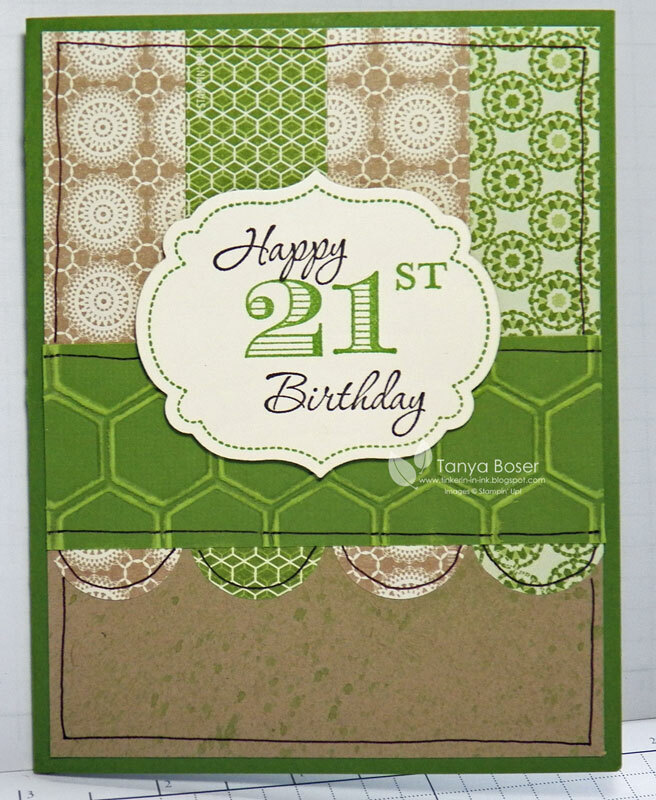 This was the first thing I made with this set, and I love it, even though it is a nearly one-layer card. It has enough complexity to make me happy :) I used the Aquapainter and some Whisper White reinker to paint the line art flowers after embossing them in white. My Paper Pumpkin is a monthly subscription to a complete project in a box from Stampin' Up!. This is the trial package that you can get without subscribing and gives you an idea of what to expect before you commit. I just got mine last week and decides to play with it a bit. ETA: I found a challenge this fit into perfectly! 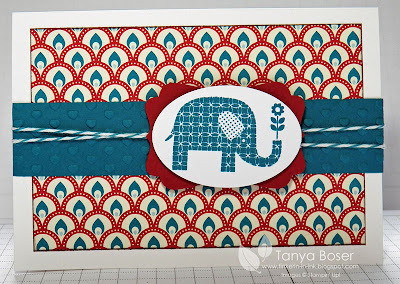 Check out the My Paper Pumpkin Challenge here. 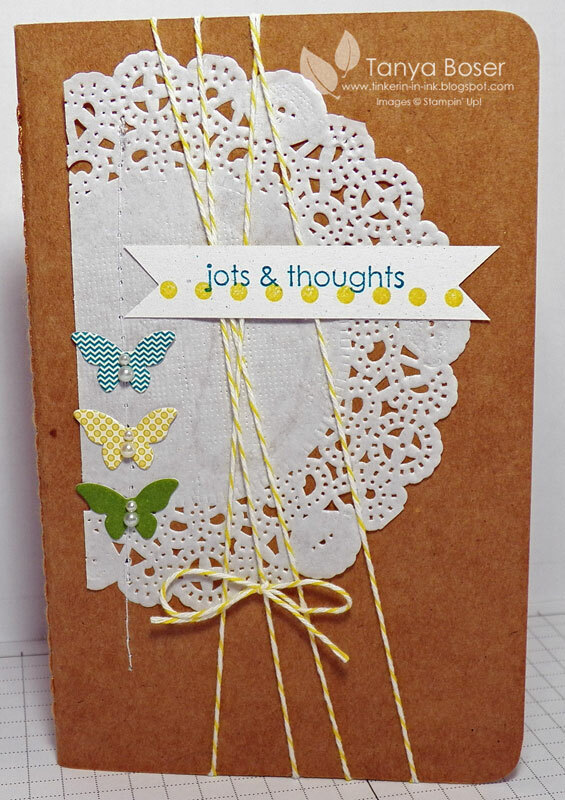 The project is to little notebooks 3½"x5½" in size that comes with the 2 stamps shown, Daffodil Delight Baker's Twine, and a sheet of 12 cute little cardstock butterfly stickers! 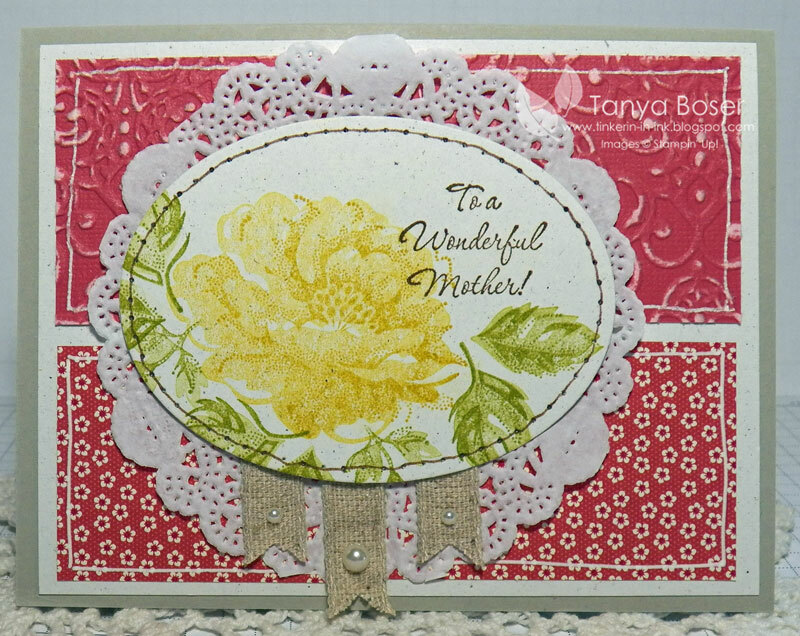 I couldn't resist using some of the supplies I had on hand (the doily and the pearls, and a scrap of Naturals White paper) and I stitched the doily down on one side. 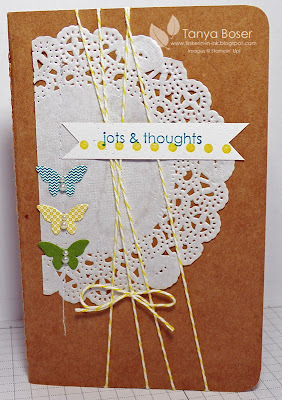 I love how this turned out, and I still have a bunch of butterflies, twine, and another notebook to decorate! Click here to order the Try It kit. Click here to subscribe to My Paper Pumpkin. 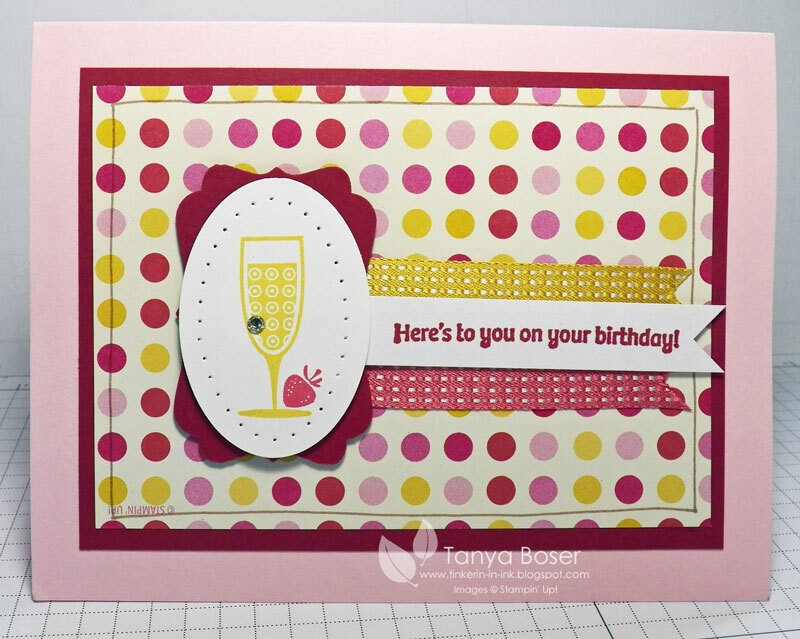 And don't forget to choose me, Tanya Boser, as your demonstrator if you don't already have one! It is the season to make a pile of Mother's Day cards! At my house at least :) I need to take a bunch to sell at work. 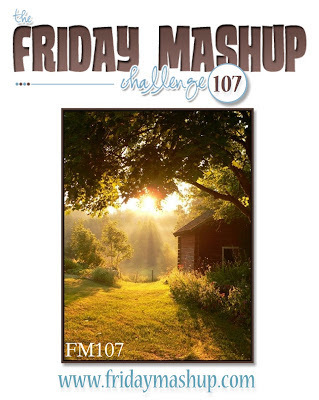 I needed a little inspiration, so I hopped over to MojoMonday and Friday Mashup! for a little help. 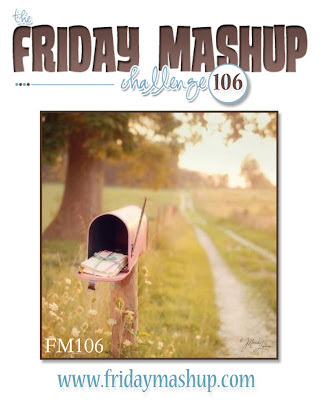 I started with the color challenge from Friday Mashup, which was Sahara Sand, Wisteria Wonder, and Perfect Plum. A bit of a challenge, I must admit. Then I looked at a couple sketch challenges and finally settled on this one. And away I went! 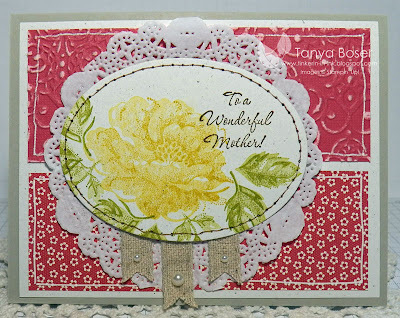 More Mother's Day cards to come, so stay tuned! 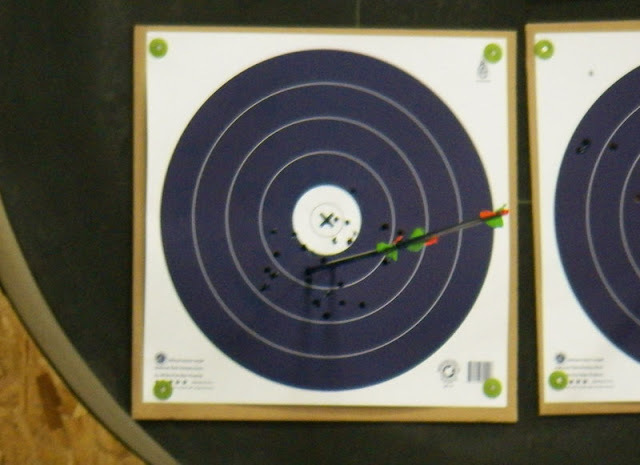 Arrows and a Robin Hood! On my hubby's birthday, we went to Owatanna, MN for a State Archery Competition to watch Dakota compete. He just took up archery this winter and is loving it. Jamie made his own compound bow in high school and has toyed with the thought of bow hunting for deer and I think this was the deciding factor. 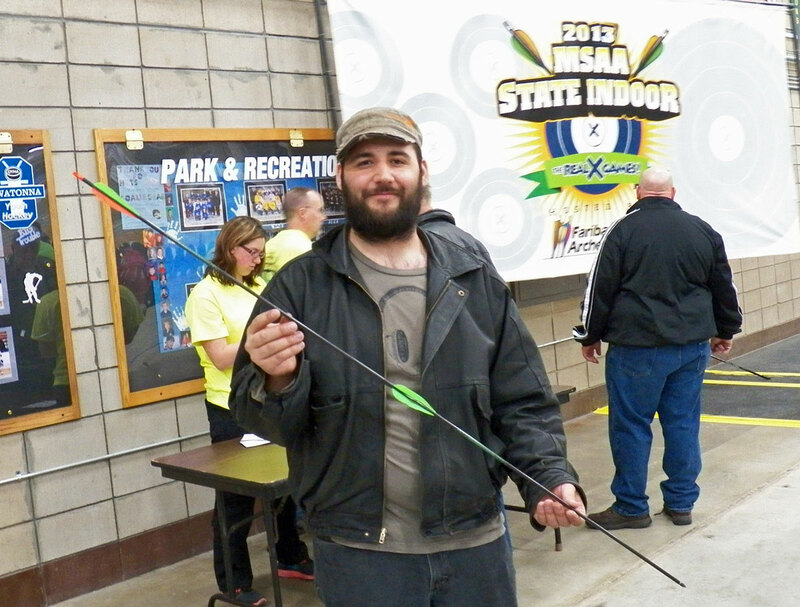 Dakota did not place at the competition, but he got a Robin Hood, which impressed the heck out of a lot of people. One fellow commented "Impressive! But expensive..." What is a Robin Hood, you may ask? Check it out! A Robin Hood is when you shoot an arrow into the target, then shoot another one so exactly into the end of the previous arrow that it is now stuck in the shaft of the first one! 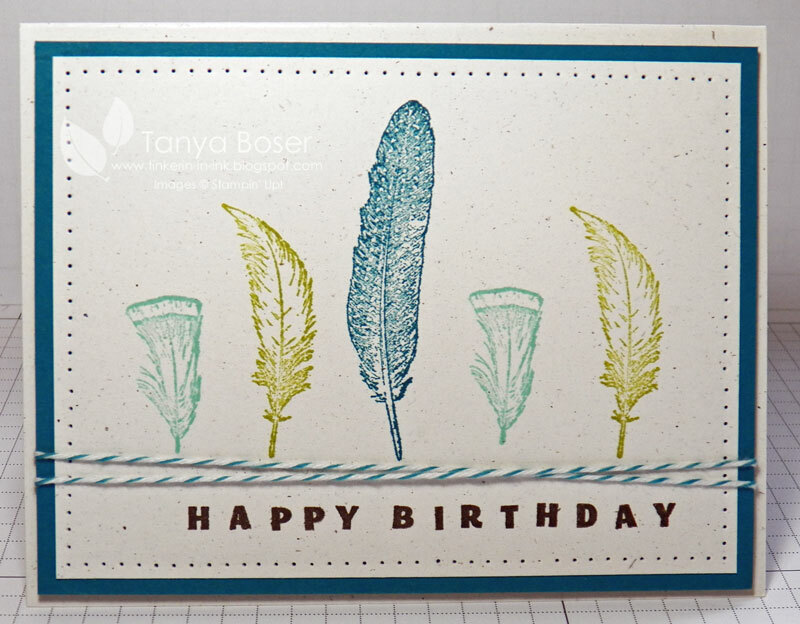 The tip of arrow #2 ended up below the fletching (feathers) of arrow #1! Amazing that it happened, and even more amazing that it happened at the competition. Dakota's grandpa told him he should have bought a lottery ticket that day, lol! This is what it looked like in the target. 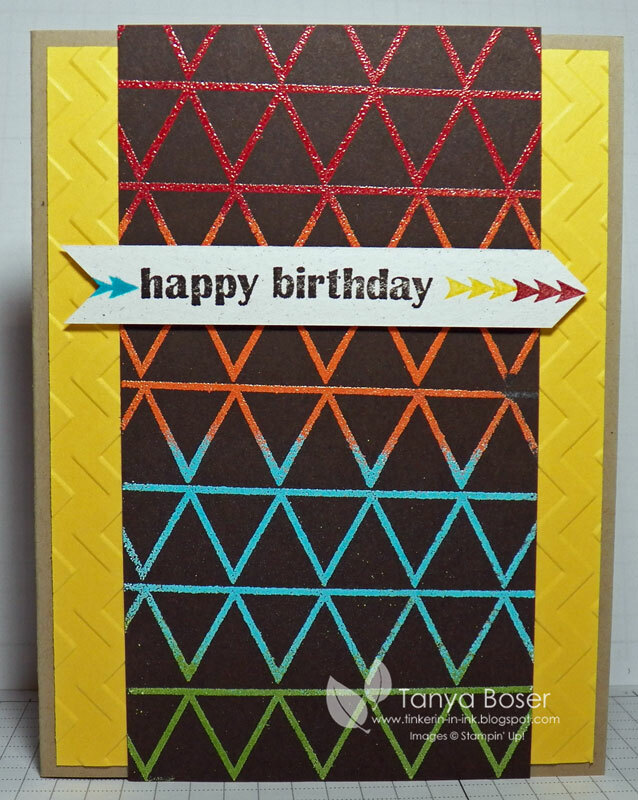 So, for Jamie's birthday I decided to make a card featuring arrows, and apparently a lot of embossing, lol! The idea for this one just popped into my head, and looks pretty much just as I pictured it would. 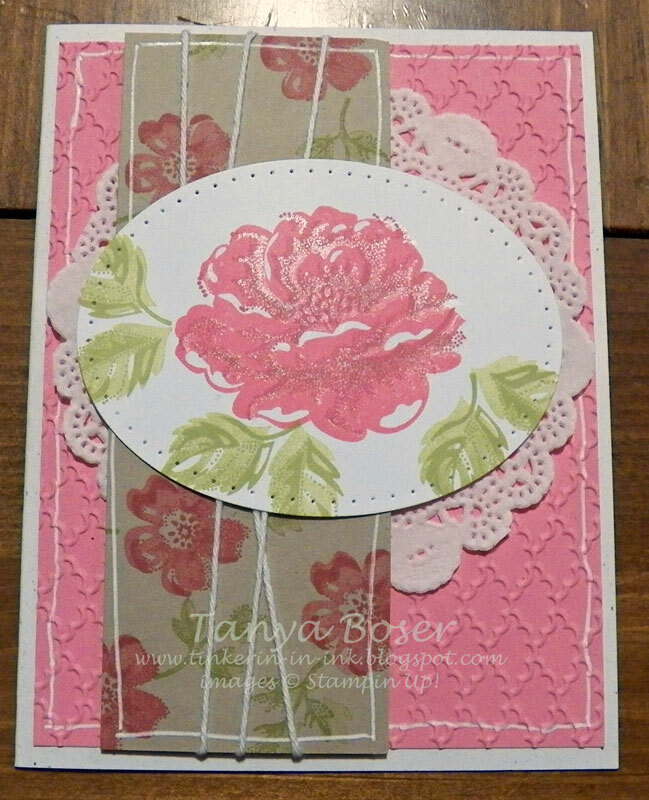 And my guys thought it was a great card :) I then decided to make a few more for my stash. 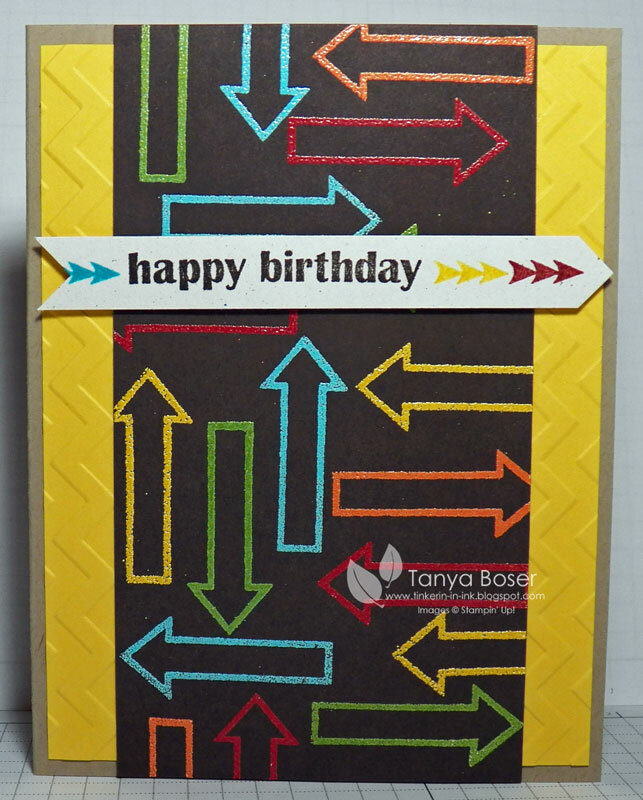 But my hubby's had his age embossed in the yellow embossing powder randomly with the arrow and the sentiment strip was punched to look more like an arrow too... he has the card stashed so I have not gotten a picture of that one. I thought I would try this less labor intensive version too. 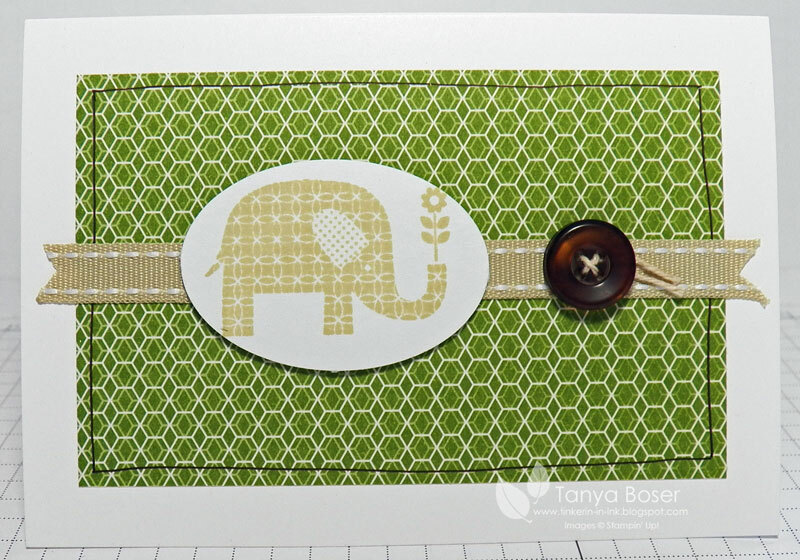 The pattern on this one is made with the banner stamp from Designer Typeset set. Which one do you like better? This is a pretty simple card, which really aims at masculine. You can't really tell in this picture, but the matted panel is actually popped up on dimensions. 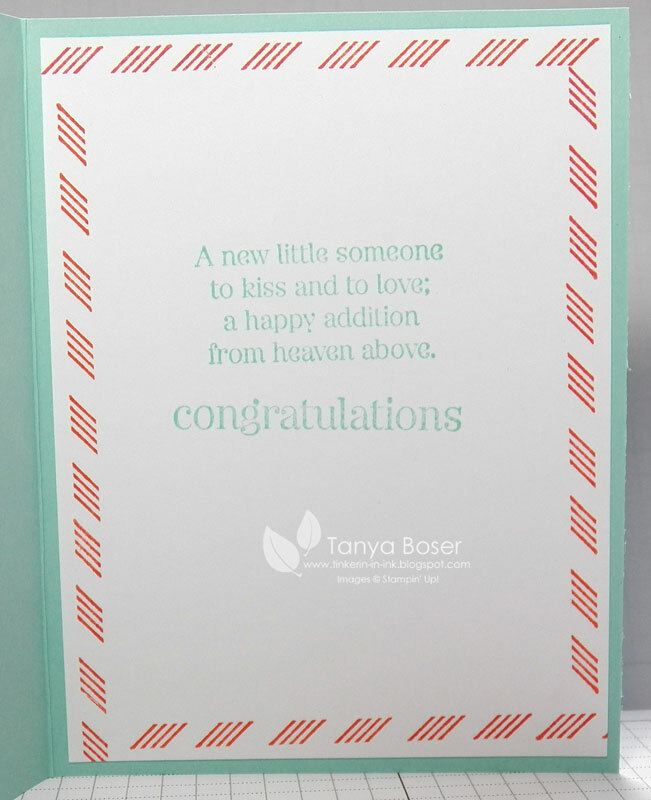 The sentiment is made with the photopolymer stamp set that SU came out with last month. I love that you can see exactly where you are stamping each and every image. I thought I would try it again with a different drink glass. It works too! Lately, ombre color palettes have been everywhere. They can be quite beautiful. I thought I would give them a try. But mine are not just shades of the same color, more of a shift toward a color. The first one turned out so well, I had to make another one. 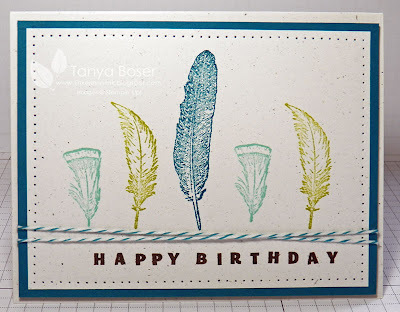 This one is made with Island Indigo, Lucky Limeade, and Pool Party, and I had to add the Signo white gel pen :) I can't believe I resisted it on the first one! 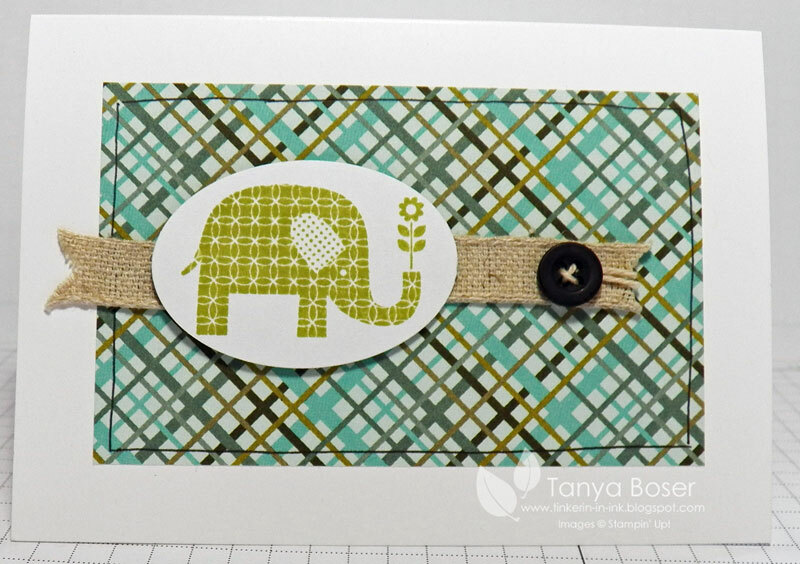 When I look at this little elephant from the SAB set Patterned Occasions, all I can think of is baby cards! He is just so cute!!! So, I have this package of notecards and envelope sitting on my desk begging to be used, and a friend who had a baby last month. So I think, maybe she needs some cute little thank you cards to send out. 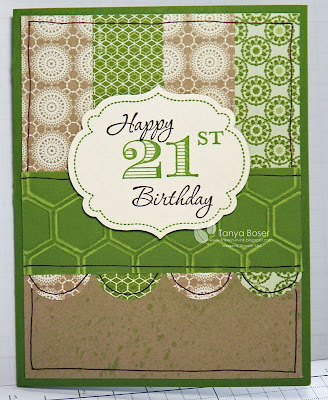 And then I start making some with different patterned papers. I had to restrain myself! How about some Island Indigo and Cherry Cobbler? 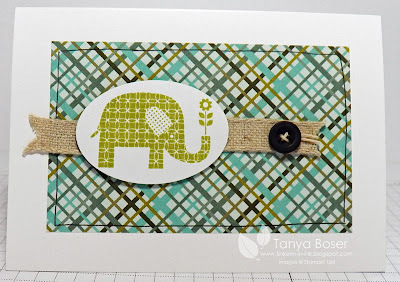 The DSP is from Festival of Prints from the Holiday Mini. 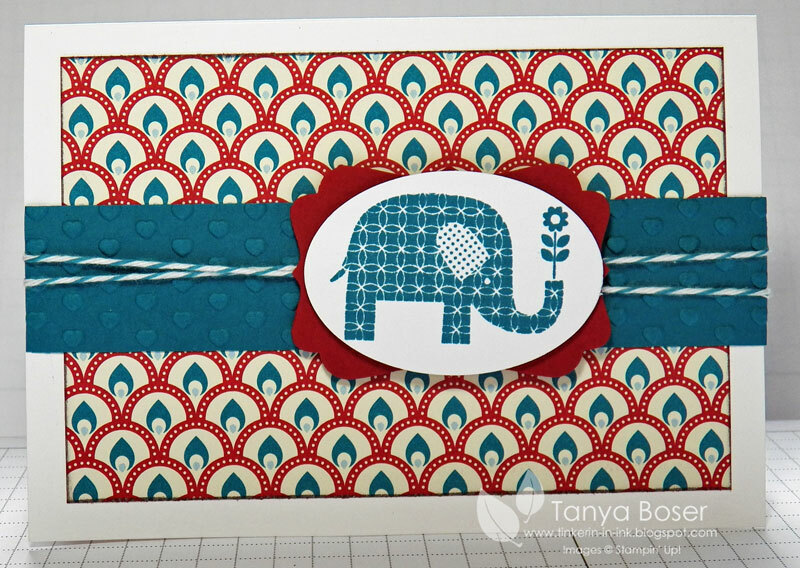 Some embossed hearts and Island Indigo Baker's Twine to round it out. 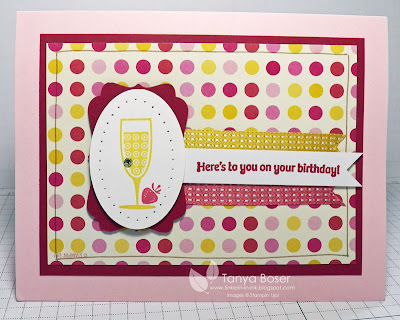 Midnight Muse and Summer Starfruit came out to play with some more Print Poetry DSP! Lucky Limeade and Natural Trim ribbon look great with this non-SU stripe/plaid I had in my stash. Pool Party goes really well with this paper too! I fell in love with the Stippled Roses set this fall, bought it, then let it sit on the shelf for months thinking "why did I buy that set?" Then, I started playing with it last month while I was dreaming of summer, and gardening, and the flowers I might plant come spring. I found that I really do love this set! 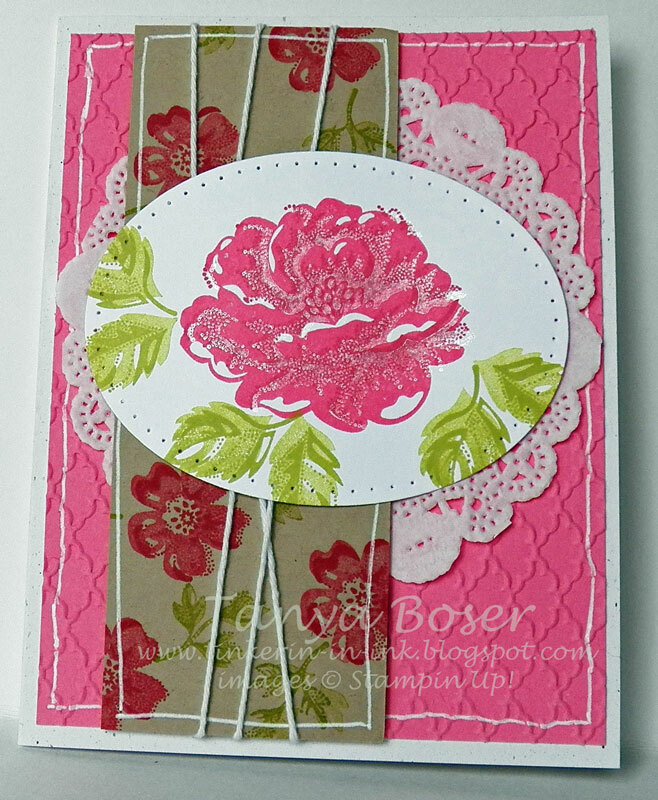 You can create beautiful roses and little posies effortlessly with it! 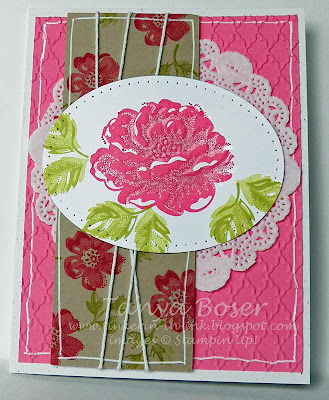 This is actually a card I made for a swap, so I made ten of them, but only kept one. 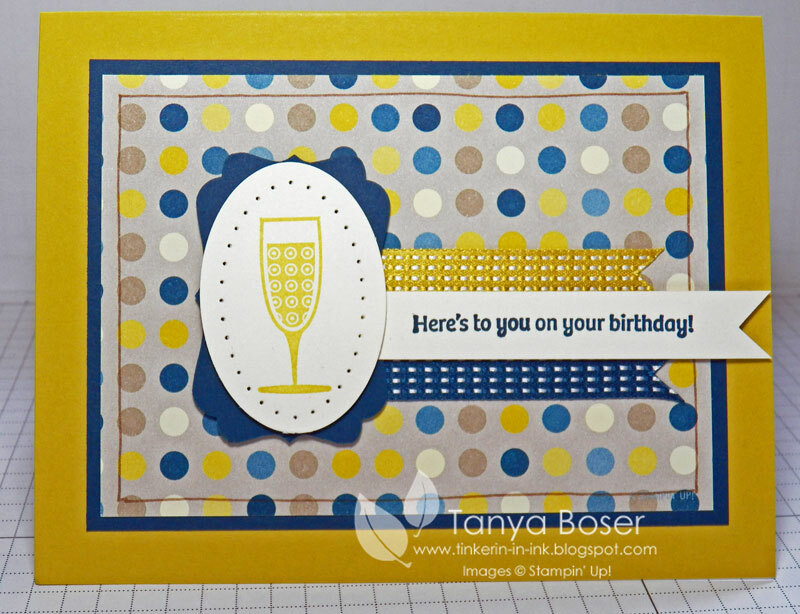 And did you notice that I used more of the Print Poetry DSP pack? I have 24 out of 48 sheets left with 2 months to go before it retires! Do you think I will get it all used up? 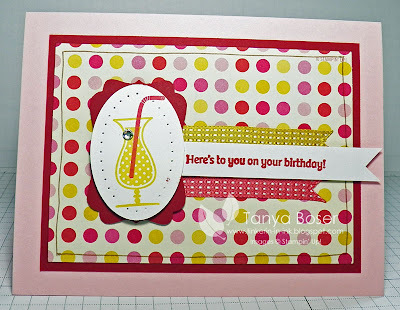 The Core'dinations got a little action here too, and well as several other accessories from the Occasions Mini. I didn't realize how much stuff was from the mini until I had finished them all! 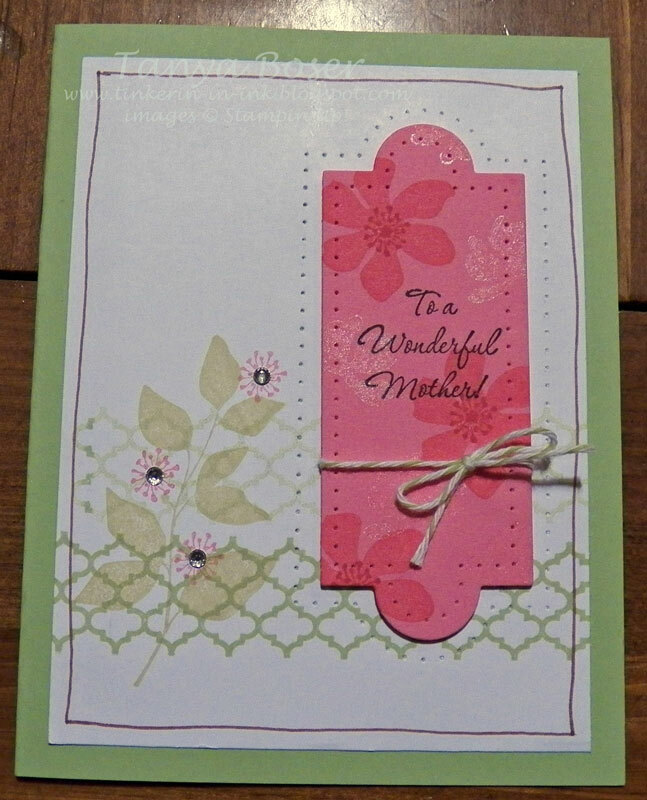 I think this could be used for any occasion to your mother, depending on what you write on the inside. 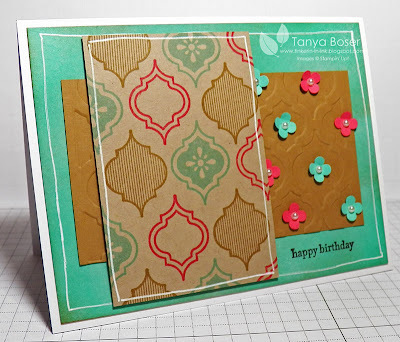 And we at Stampin Addicts are here to help you think about these lovely colors before they go away forever. 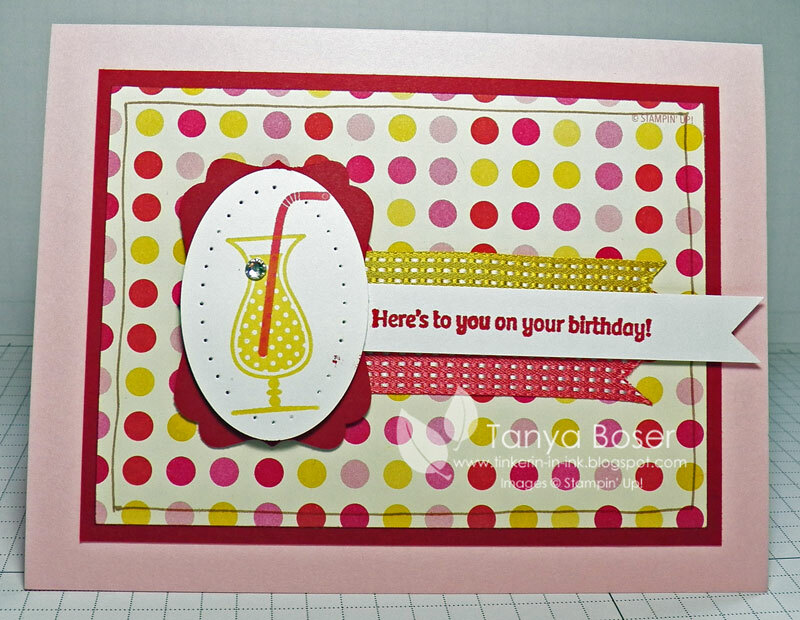 I am the first stop in the hop, and I am featuring Regal Rose from the Brights collection. 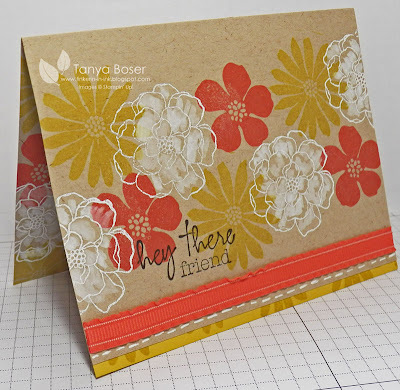 If you started somewhere in the middle, you may have just arrived from Betty's blog where she is featuring any and all of the retiring colors. Go Betty! You rock! All three of her cards are so darn cute! And please excuse the quality of these pictures, I took them at 01:00am, while out of town. I did not have my usual lighting set up and I will take better ones when the sun comes up :) Fixed Now! 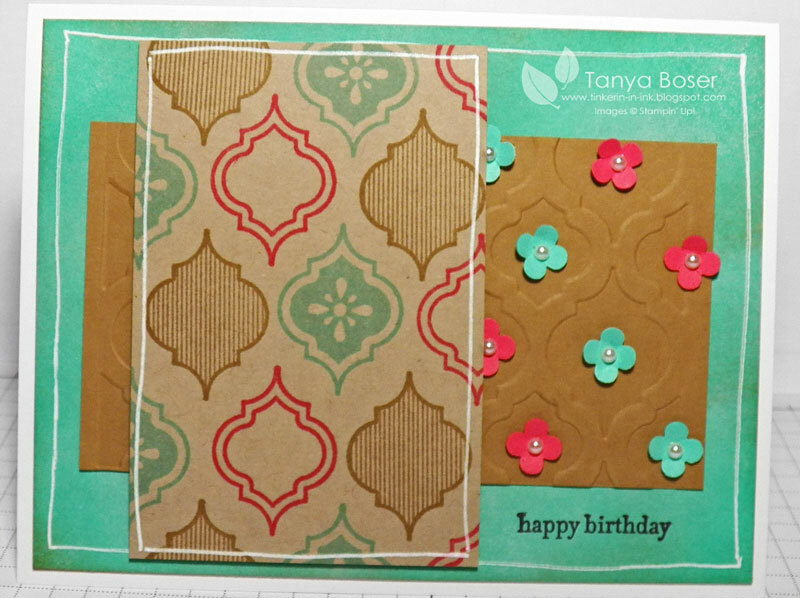 I did a little bit of collage work here and used a set that I bought a while ago but have not used. Bad Tanya! I also used a couple more of the retiring colors here. 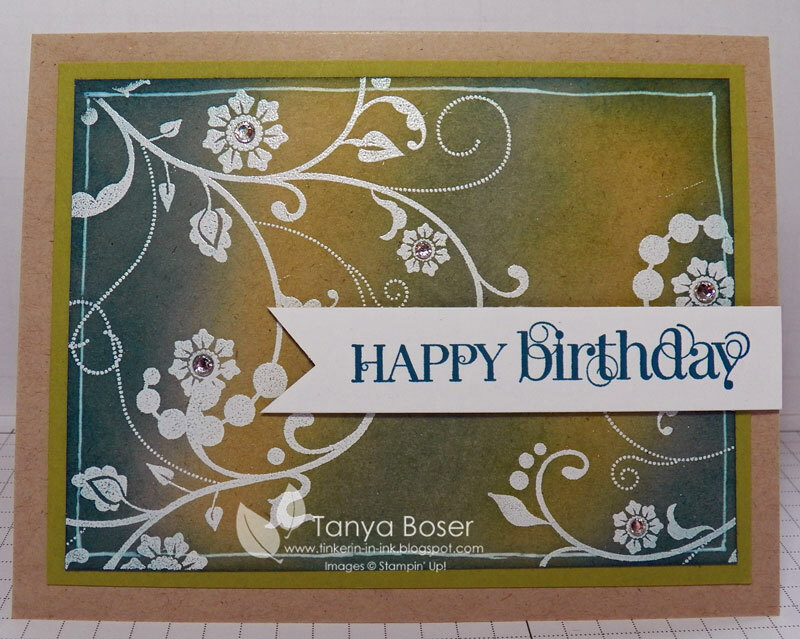 On the Regal Rose diecut, there are even some shimmery flowers stamped with the Illuminate ink. The centers of the big flowers are actually Primrose Petals. Don't Regal Rose and Primrose Petals inks complement each other well?! Why didn't I notice that before? I think I should have added a mat under the white layer, maybe in Early Espresso. What do you think? 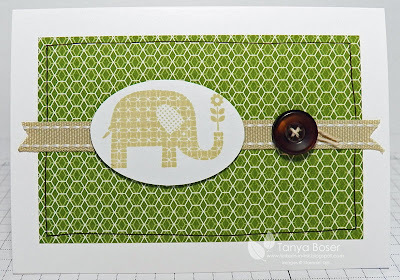 So, I only brought one sentiment set with me when I rushed to pack my stampin stuff before leaving town on Friday. 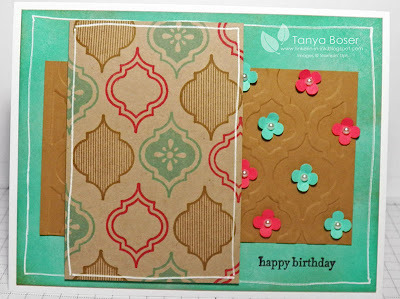 I guess this will be a general card :) I like the slightly whimsical feel of this card. 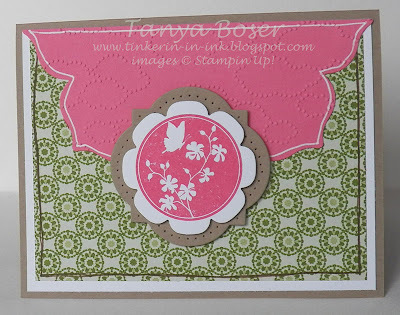 Now, it is time to move on to stop #2, Yapha Mason with Pretty in Pink! And don't worry, if you get lost along the way, here is a link to get you back on track. One of my Stamp Club ladies (friend, co-worker, husband's boss too) had a baby last month and I wanted something special for the card. The delivery was a dangerous one and we are so happy they are both doing very well now so this was an even more special delivery :) Welcome little Isaac! Here is the inside. It looks a little washed out because it is. I accidentally grabbed some cheap white cardstock to line this with and it did not take the ink as well as I would have liked... but you can still read it fine. Live and learn! My #3 child, Dakota, turned 21 the middle of March. Right before St. Patrick's day! He has always loved green.... think there is a connection? And just in case you are wondering, he did not get smashed on his birthday or on St. Patrick's day but he did go out on both of those nights :) Dakota is a pretty responsible young man. He wants to be a RN and a youth pastor. Quite the combo! We took him to Brigid's Cross for an Irish Pub dinner and his first drink. We didn't stay out late because it was a work night, and it was supposed to snow that night. Dakota plows for one of the local businesses and was going to have to be out to work at 03:00, poor sod! 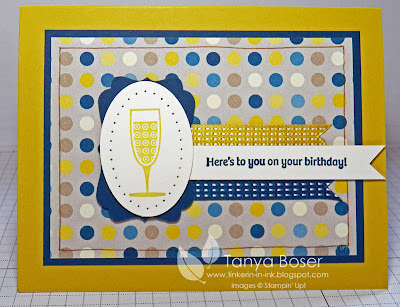 Ok, now on to the card! 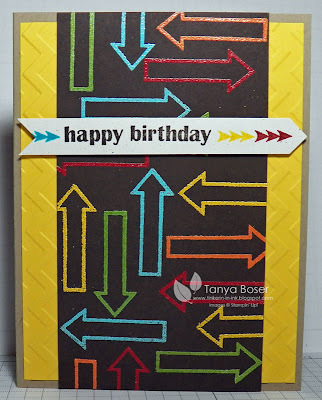 Yup, more of the Print Poetry DSP went into this card. I'm about 1/2 way through the pack now! I pulled out some of the Core'dinations paper from the Holiday Mini. I really love this stuff! 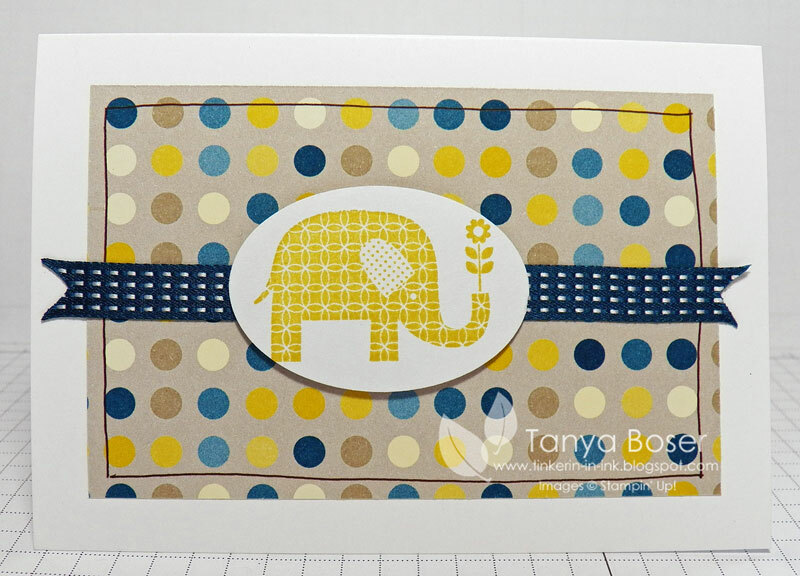 I'm kinda hoping they keep adding colors :) The rounded bottoms of the strips are really 1" circle punches. I pulled out the Spritzer too. Love it!